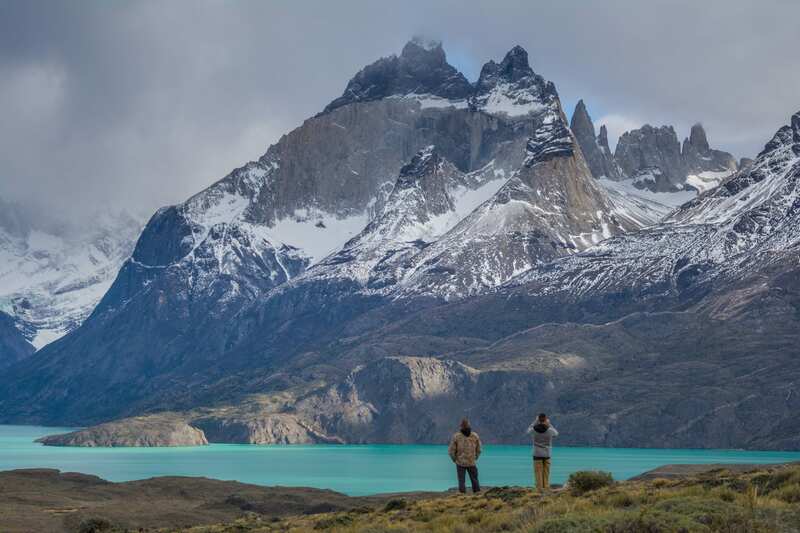 Dare to enjoy a unique experience in one of the leading hiking circuits in the world: the tour of the Paine Massif, where nature invites you to challenge your body and mind. 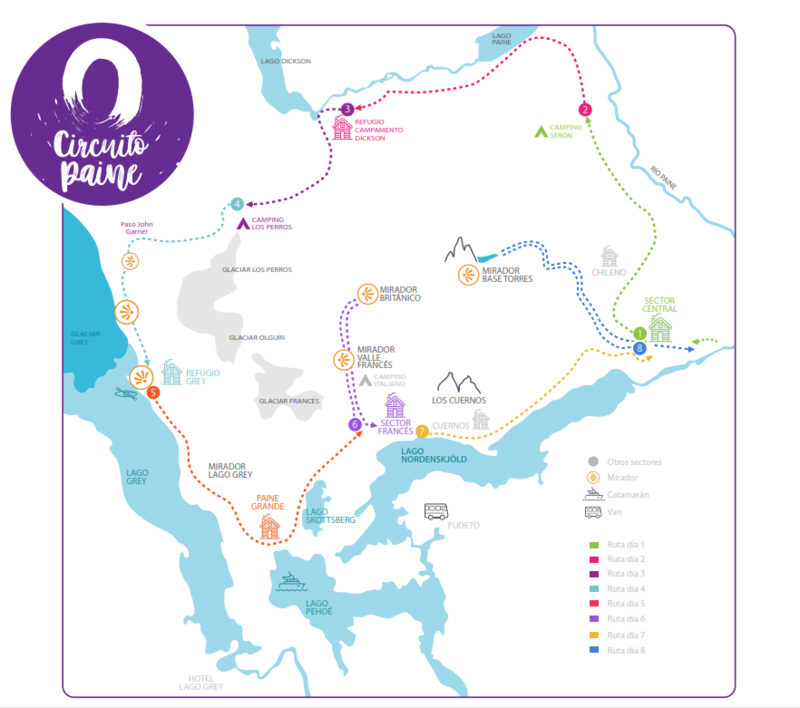 For 8 intense days you will be amazed by the granite towers that give the park its name, the legendary Francés Valley, or the striking Grey Glacier seen from the John Garner mountain pass where the ice blends into the clouds on the horizon. An experience that will take your breath way. 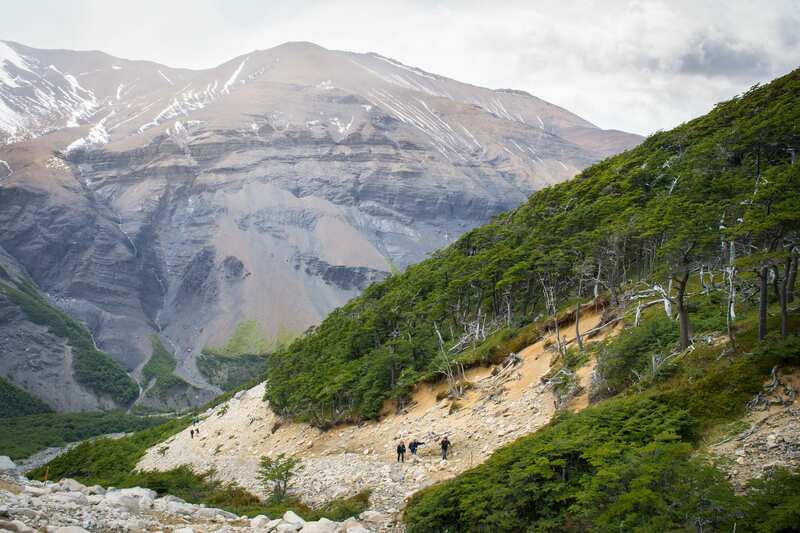 Day 8: Hike to the Torres Base and return to Puerto Natales. 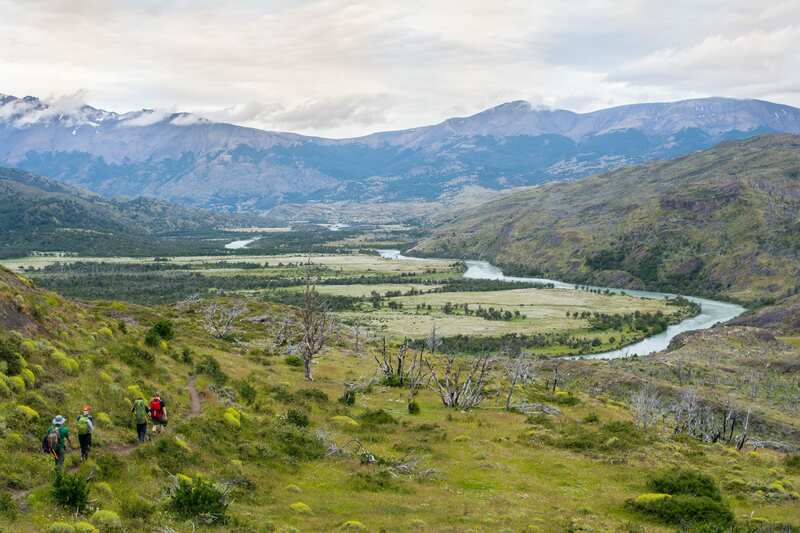 The day before you begin your adventure, you must go to our office in Puerto Natales to pick up your voucher and welcome kit, as well as resolve any questions you may have. At 6:30 am you must be at the Puerto Natales Bus Station (Rodoviario located on Avenida España 1455) to take the 7:00 am bus to Torres del Paine National Park. 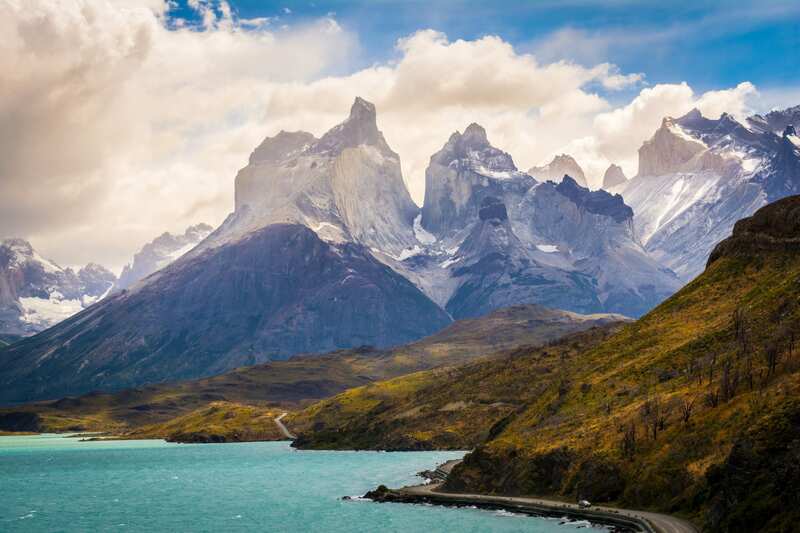 You will enter the park through the Amarga Lagoon Checkpoint, where you need to show your ticket and then take a bus to Cerro Paine Reserve’s Welcome Center. 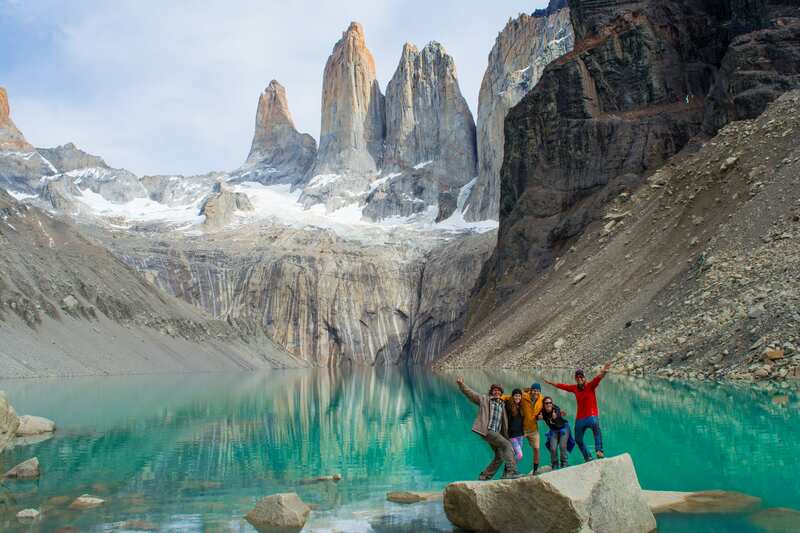 There, you will enjoy the striking silhouettes of the Torres del Paine and Almirante Nieto mountains, and your ﬁrst hike will begin. It will lead you through a huge lenga beech forest draped with lichen called “old man’s beard.” After going through the forest, in the distance you will behold a large valley covered by daisies and bordered by the Paine River on the right. The river will accompany you during the second half of your hike until reaching Serón Campsite, where you will dine and sleep. This will be a long but unforgettable day of hiking. The ﬁrst part of the trail will take you up and down the slopes of Paine Hill, where you will feel the power of the wind. You will then begin your descent and walk along the shore of the Paine Lake, which on clear days acts as a mirror for the mountain peaks around it. 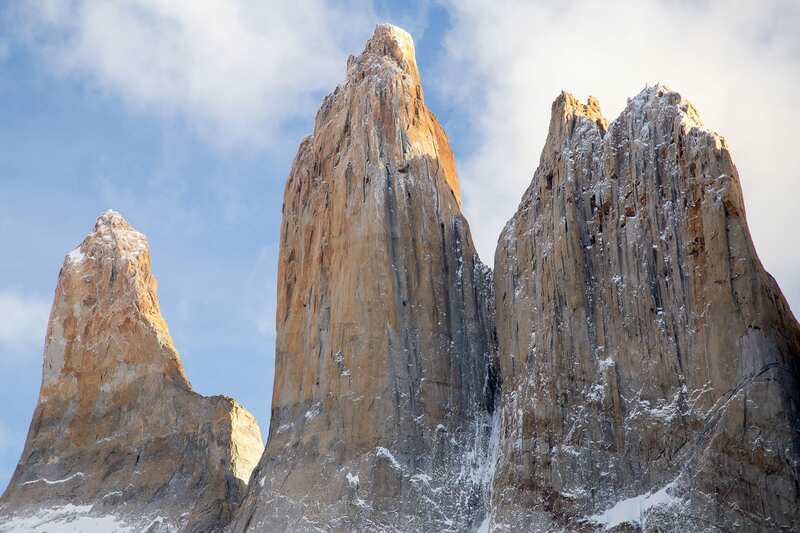 If the weather is good, you will be able to see the northeast peak of the Paine Massif, including peculiar shapes and silhouettes such as “Cabeza del Indio,” “Escudo,” “Cubo,” and Dickson. You will spend the night at the Dickson sector, located by the glacial lake next to the Southern Ice Fields that give this sector its name. Today you will begin to go towards the southwest. Along the way, you will see the Dickson glacier falling into the lake of the same name. You will enter a beautiful lenga beech forest, where you will see Magellanic woodpeckers tapping the beech trees. Right in the middle of the forest, you will ﬁnd a clearing. Stop there for a moment to look forward and backward and you will be able to see glaciers in both directions. Amazing! 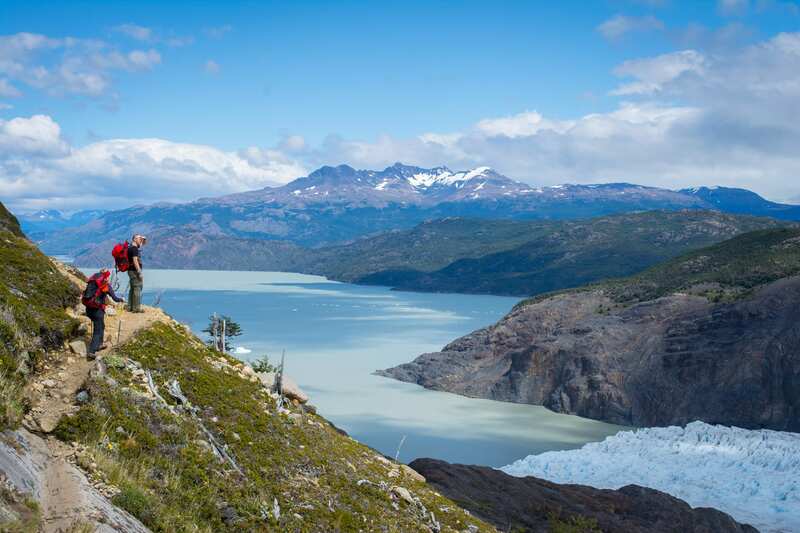 Further on, you will cross Los Perros Glacier, with incredible views of its lake. Thirty minutes later you will arrive at Los Perros Campsite, located in a quiet, ancient forest. *In the Perros Sector, the meal service is provided with lunch boxes and there is no restaurant service. Today will probably be the most exhausting but also the most spectacular day of your trip. Warning: there will be slippery and swampy terrain, as well as steep climbs and descents. You must leave Los Perros early in the morning. On the ﬁrst part of the trail you will cross through swampy land followed by a long, steep climb to the windy John Garner mountain pass. Once up there, the breathtaking view will make you feel quite small. Right in front of you will be one of the huge tongues of the Southern Ice Fields, ﬁlled with cracks and ice of the rarest shades of blue and green. A landscape where you do not know where the glacier ends and the clouds begin. 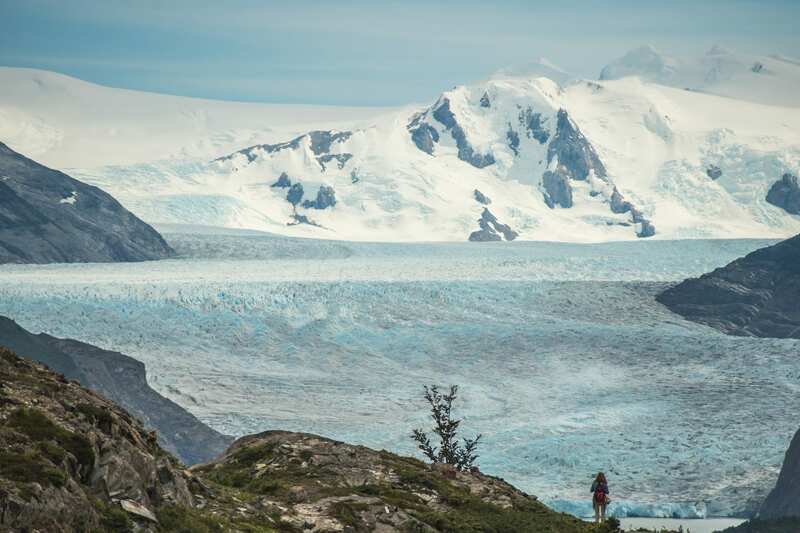 ering an amazing view of the Grey Glacier, a scene that is hard to forget. 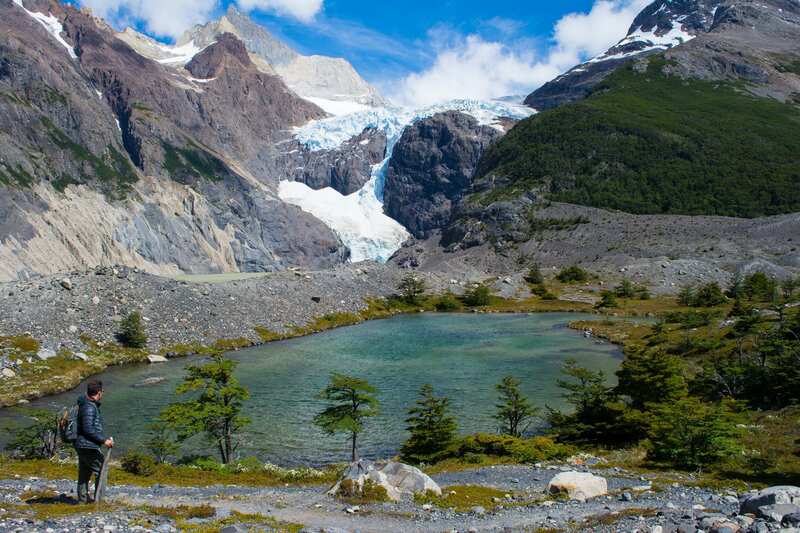 Paine Grande Mountain Refuge, where you can stop to have lunch and enjoy the amazing view of Los Cuernos del Paine. 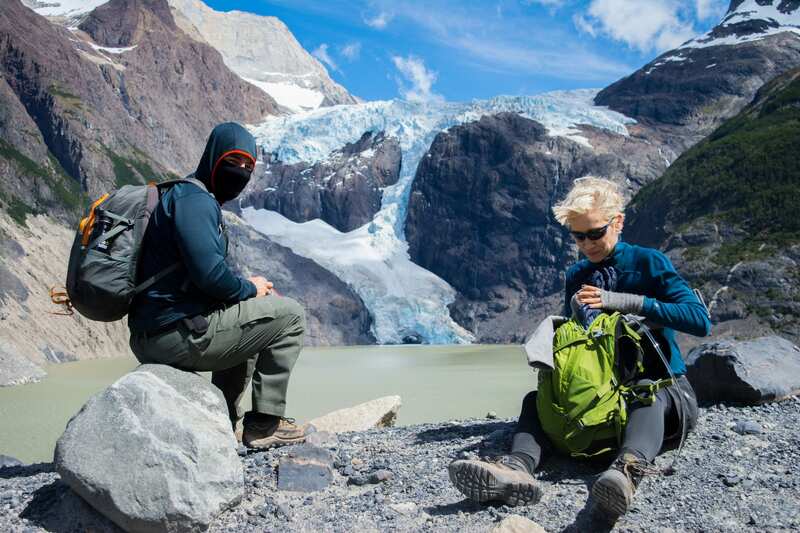 Then, you will continue on to the Francés Sector with Los Cuernos ahead of you, Pehoé Lake to your right, and another face of the Paine Grande Hill to your left. After an easy but long walk, you will reach the Francés Sector, where you will dine and sleep. On this day you will visit another one of the most iconic and magical places in the park, the striking Francés Valley. The hike will begin with an easy walk towards the Italiano Campsite. There, you will begin the climb up through the valley and then reach the “Francés Lookout Point” after 1.5 hours. 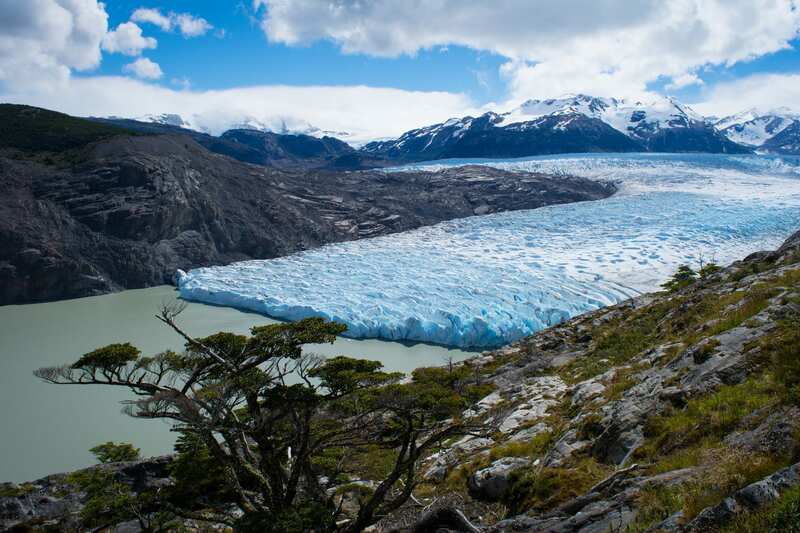 Up there, you will see one of the hanging glaciers of Paine Grande Hill up close and, if you are lucky, you will witness an icefall (avalanche). With that impressive sight still in your mind, you will cross through a lenga beech forest leading to the Británico Sector. Get ready, this might be the only time in your life when you will enjoy such a sight: the magniﬁcent Francés Valley ﬂanked by its colossal mountains and granite walls. Their unique shapes and colors will astound you. You will return via the same trail, passing through the Italiano Campsite until reaching the Francés Sector. 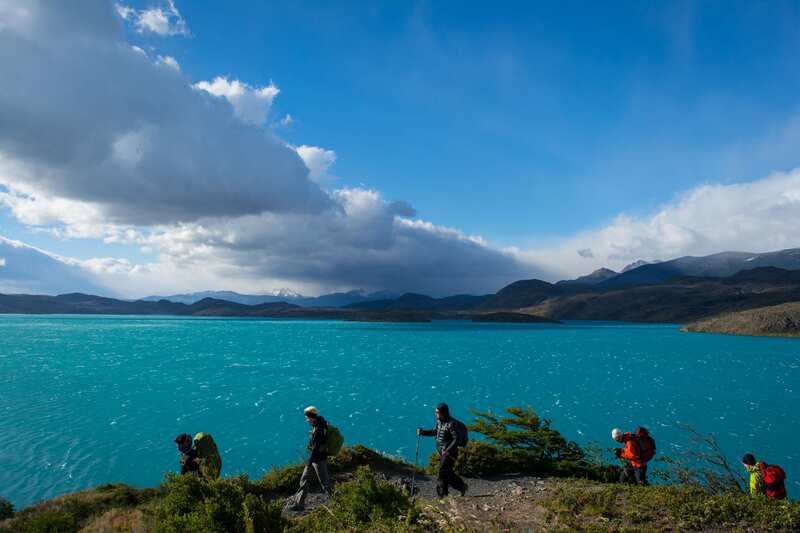 With the spectacular Cuernos del Paine to your left, and the colors of the Nordenskjöld Lake to your right, you will walk towards the Central Sector. This day the hike will be more relaxed, there will no steep slopes, and the journey will be shorter and faster than the days before. 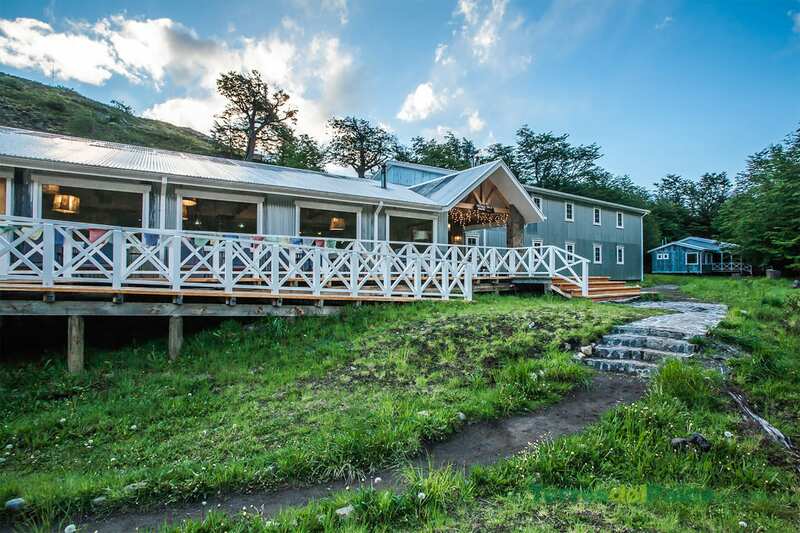 A few kilometers before reaching the Central Sector, you will leave Los Cuernos behind to go around Almirante Nieto Hill (2,670 m), a massif with a changing climate. At night, just like throughout the rest of your adventure, you will be able to enjoy the relaxed and cosmopolitan atmosphere at the Central Sector, have a well-deserved beer and share your experiences and stories with other hikers. If you feel tired after so many days of dicult hiking, you can stop by the Hotel Las Torres Spa for a well-deserved massage, or to try the famous cordero al palo (spit-roasted lamb). These services are not included in the program. Today, you must get up early to visit the most iconic place of the park, Las Torres Base Lookout Point. First, you will walk through the pampa, cross the Ascencio River and then climb about 3 km up to Los Vientos mountain pass. 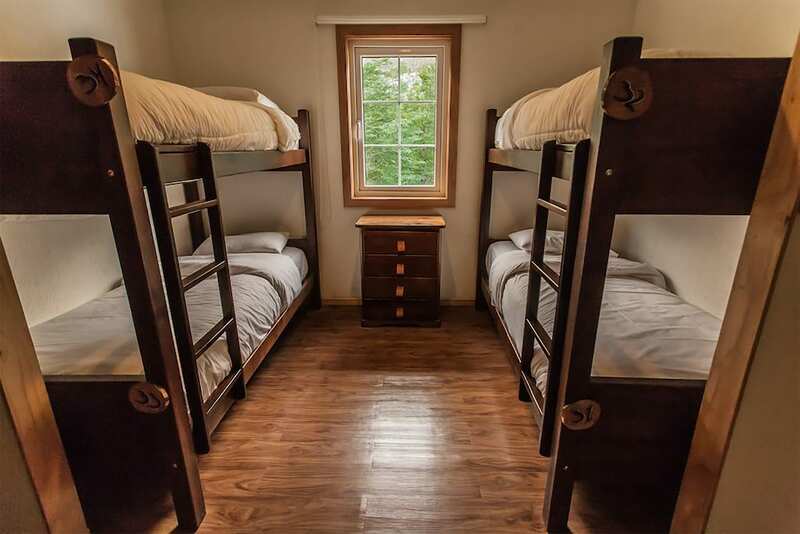 Here you will enjoy magniﬁcent views of the valley, lakes, and glaciers. 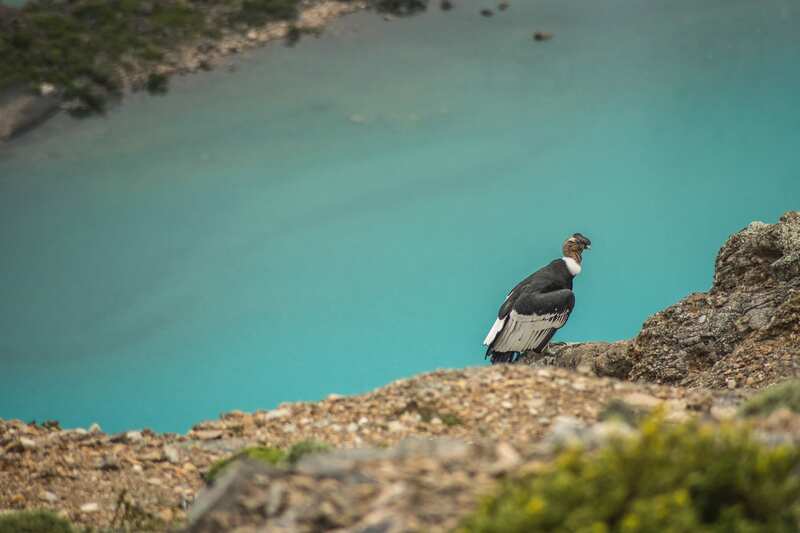 You will continue on until reaching the Chileno Mountain Refuge, and then go deep into a lenga beech forest up to “La Morrena,” where the hardest part of the hike begins. After 45 minutes of ascending up a rock trail, you will reach the spectacular Las Torres Base Lookout Point where you will be able to enjoy the grandeur of Torres Sur (2,850m), Central (2,800 m), and North (2,600 m). After taking in the spectacular scene, you will return to the Central Sector where you will take the bus back to Puerto Natales at 7pm. Transportation on regular bus from Puerto Natales to Torres del Paine and back. *Lodging location for the last 2 nights will depend on the availability at the time of the reservation. Any service not specified in the program. 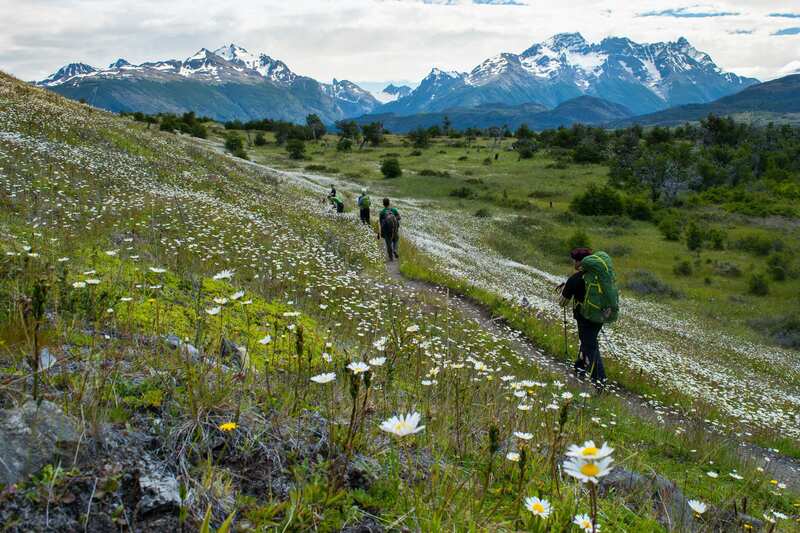 Accommodations in Puerto Natales Excursions or additional activities. Health insurance of any kind. Guide (except for the guided program option).